Max Whitmore is a personal trainer with more than three years experience in individual and group fitness. Whitmore has a Bachelor of Arts in English literature from the University of Cincinnati, fitness certifications and dietetics training from Cincinnati State Technical and Community College. Whitmore has written for several online publishers. Transit time is the rate at which food passes all the way through your digestive tract – from ingestion at the mouth to elimination. On average, it takes between 24 and 72 hours for food to pass completely through the digestive tract; although transit times vary by individual based on diet, activity levels and general health. If you are concerned about your bowel transit time, making minor adjustments to your diet and exercise habits can improve your rate. Consult your physician before starting a diet and exercise program, especially if you have a known bowel disorder. Exercise. 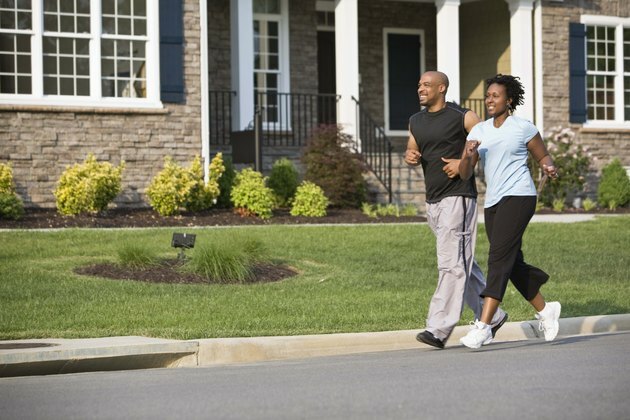 Do at least 30 minutes of light exercise, such as walking, most days of the week. Your digestive tract moves food and digested material through a series of muscle contractions called peristalsis. Being sedentary slows the process of peristalsis and decreases transit time. Consume 20 to 35 grams of fiber per day. Fiber adds bulk to your feces and helps stimulate the muscles in your bowel to contract and push food along. Fiber-rich foods include whole grains, leafy vegetables and fresh fruits. Increase fiber intake gradually. Adding too much fiber to your diet too quickly can cause uncomfortable symptoms, like gas, bloating and abdominal cramps. Drink at least eight 8-ounce cups of water per day – more if you exercise or sweat a lot. Water keeps your feces moist which improves transit time through your digestive tract. If your urine is dark yellow or gold, drink more water. Consult your physician if you experience more than 72 hours, or three days, between bowel movements. If you have trouble getting enough fiber in your diet, use an over-the-counter fiber supplement per the manufacturer’s instructions. Avoid taking laxatives. Although they can improve motility, if you use them too often you can develop a dependence and your bowels might not work without them. What Do I Do if I Eat Too Much Fiber? How Does Caffeine Affect the Bowels of a Person Who Has Acute Chronic Gastritis & Diverticulitis? Should You Take Laxatives Before or After a Meal?